The body of Indian prisoner Kirpal Singh, who died under mysterious circumstances in Kot Lakhpat Jail in Lahore, was cremated at his native place Mustafabad in Saida village near Gurdaspur on Wednesday. His body was brought at civil hospital on Tuesday night after conducting a postmortem at Government Medical college Amritsar. His nephew, Ashwani Kumar lit the pyre, while Deputy Commissioner Pardeep Sabharwal and SSP Jagdip Singh Hundal placed the wreath on behalf of the government. Sabharwal assured the family members of Kirpal Singh that relief will be provided to them as per government norms. 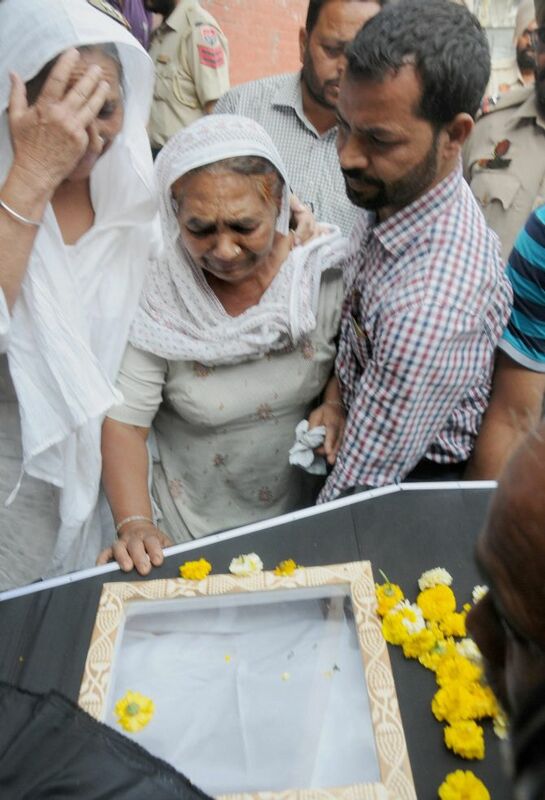 Dalbir Kaur, sister of another Indian Sarabjit Singh, who too had died in a Pakistani jail in May 2013, was also present. Kirpal Singh had allegedly crossed Wagah border into Pakistan in 1992 and was arrested. He was subsequently sentenced to death in a serial bomb blasts case in Pakistan's Punjab province. Kirpal was found dead in his cell last Monday at Kot Lakhpat Jail in Lahore. Kirpal, from Gurdaspur, had reportedly been acquitted in the case by the Lahore High Court but his death sentence could not be commuted because of unspecified reasons. During the postmortem examination conducted in India, it was found that his heart as well as stomach were missing. However, no internal and external injury was found on his body.